Samsung began rolling out the official Android 7.0 Nougat update for the Galaxy S7 and Galaxy S7 edge on January 17. With the release of the update, new and improved features promise to let Galaxy users get more out of their devices. The update also enables faster speeds for downloading apps and system software updates. Learn more about the major UX changes below. The Quick Panel features a cleaner aesthetic, as titles have been removed from the icons in the panel’s first depth. Icons in the second depth are organized into groups of nine, making them easier to locate. Users can also utilize the integrated S Finder to locate what they want on their smartphone or the web straight from the Quick Panel. Notifications are now grouped to display information more clearly and also support Direct Reply. 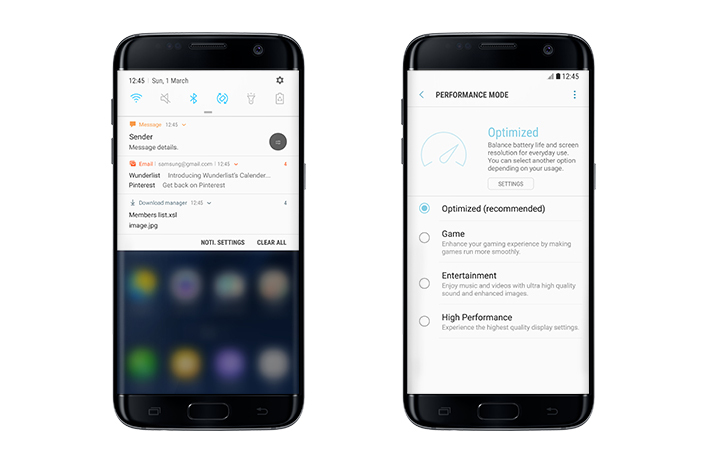 The newly added Performance Mode lets users optimize their smartphones to better meet their specific needs by activating one of the four available modes. Optimized mode, for example, extends battery life and enhances speed, and is suitable for daily usage, while Game mode provides useful functions such as Game Launcher and Game Tools. Entertainment mode enhances sound and image quality and High Performance mode enables the highest quality display settings possible. Samsung Pass, the feature that works as a master key for website login on Samsung Internet, is now supported on the Galaxy S7 and S7 edge. Users can use their fingerprint to log into selected websites and apps with Samsung Pass. The feature will soon be expanded to support mobile banking app integration.